Cleans and disinfects in one easy step. 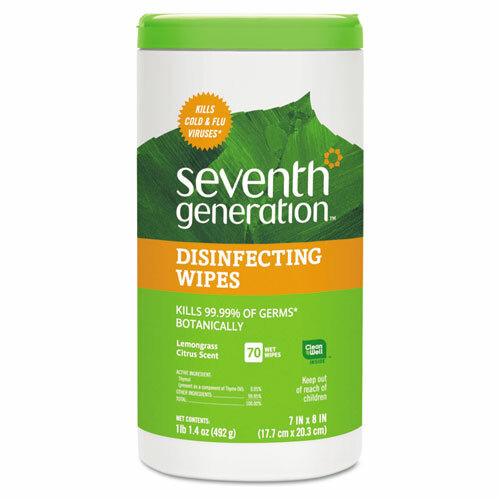 Botanical disinfectant made from essential oils. 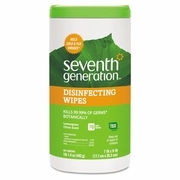 Kills 99.9% of germs botanically (see product label for details). Effective against influenza A virus. Premoistened wipes are formulated for use on hard, nonporous surfaces. Effectively controls odors. *Kills over 99.99% of household germs, speciﬁcally: Inﬂuenza A, Salmonella enterica and Pseudomonas aeruginosa on hard, nonporous surfaces. Ingredients: Thymol (component of thyme oil), Sodium lauryl sulfate (palm kernel or coconut-derived cleaning agent), copper sulfate pentahydrate (bluestone) (mineral derived water mineralizer), citric acid and sodium citrate (cornstarch derived water softeners), essential oils and botanical extracts* (origanum vulgare (oregano) oil, cedrus atlantica (blue atlas cedar) bark oil, citrus medica limonum (lemon) peel oil, cymbopogon schoenanthus (lemongrass) oil, citrus medica limonum (lemon) fruit extract, mentha citrata (orange bergamot mint) leaf extract, aqua (water). Wipe substrate: polyester, rayon.